Norway’s World Chess Champion Magnus Carlsen pulled it off again. “I never felt I was in danger,” he told Norwegian Broadcasting (NRK) after winning his fourth World Championship title in a row over challenger Fabiano Caruana on Wednesday night. After 12 remis (ties), the battle between Carlsen and Caruana went into overtime and extra games that started off with rapid chess. Carlsen went on the attack straight away. He won the first two games and only needed another remis to secure his title. 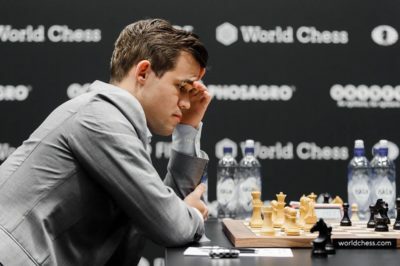 He acknowledged that Caruana was “the strongest player I have met.” Carlsen thinks he still has “a lot to work on” in order to maintain his title as World Champion. Caruana, meanwhile, said he had “a bad day” and thinks he didn’t play well. “I wasn’t even close to playing at his (Carlsen’s) level today,” he said, adding that he thought Carlsen’s victory was well-deserved.